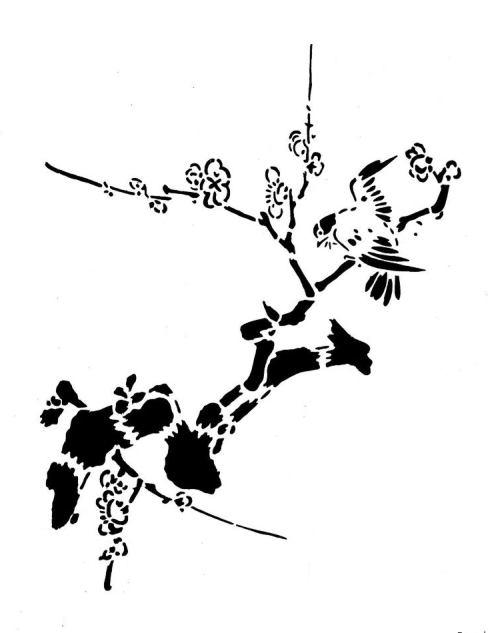 Black and white Japanese stencil of a bird on a branch. This is one of the finest quality images we’ve found in some time. It measures almost 7 inches by 9 inches and can be made smaller without losing the quality of the image. It incorporates both light and dark areas that somewhat hide the bird much like he would be if found in nature. This bird image can be used as is or perhaps just the top half for a lighter look. This graphic was included in the January 1, 1884; volume 3 edition of The Decorator and Furnisher magazine.